Ricky Gervais has announced Learn Guitar With David Brent, a new series of YouTube tutorials featuring his most famous creation. Slough's foremost songsmith and boss/entertainer will assume the role of teacher in the videos, where he will show beginners how to play Brent originals that originally appeared in The Office. Songs currently confirmed include Spaceman Came Down and Equality Street, although we're hoping the 2004 full band version Free Love Freeway, which was recorded with Noel Gallagher and included on the Christmas Special DVD of The Office, gets an airing. 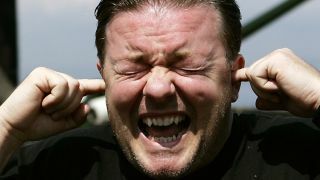 The series will premier on the Ricky Gervais YouTube channel in June, with one new episode/lesson per month. Keep an eye on YouTube for Brent's online debut, and in the meantime enjoy Equality Street, as recorded by Brent and Johnson for Comic Relief earlier in the year.